In our studio group crits, while I was telling to my group about my idea someone suggest me the book “Nutshell” by Ian McEwan. These are some parts from this book that I found them interesting. It’s a novel for an unborn child telling the story of his parents. I didn’t read the whole book but I liked these parts and I found them inspiring. This idea of a private space, unknown of the outer world and how the writer describes it. 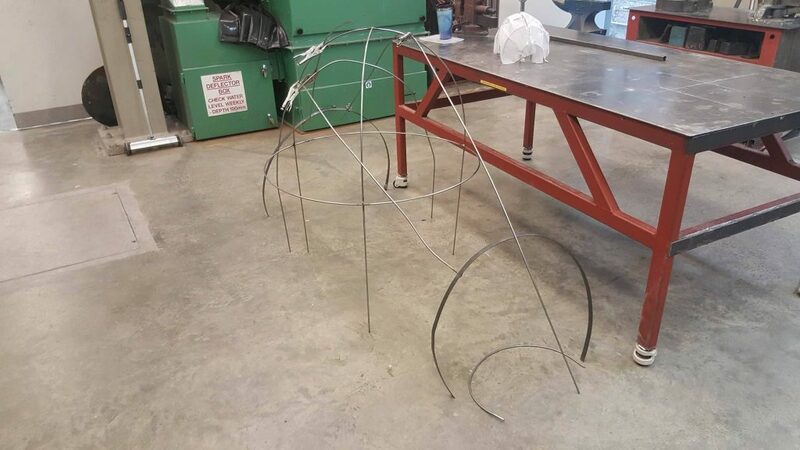 I have so much fun being in the metal workshop and making this metal structure for my installation. Through this work I explore many techniques and materials. I experimented with different materials to find the one that I thinks it fits better. Packing foam didn’t work because I didn’t manage to harden it. This is the result of the fabric mache. I have put three big pieces of fabric, different kind and colour. 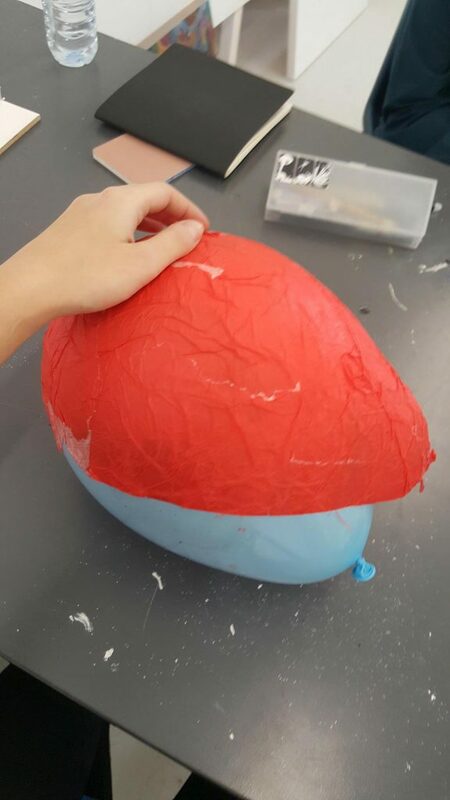 After a chat I had with Broghan from my group at our studio, I decided to put a red coloured fabric inside and a plain coloured fabric from the outside. I really liked this idea of the unknown. The viewer won’t see the interior colour of the sculpture until he will go inside. 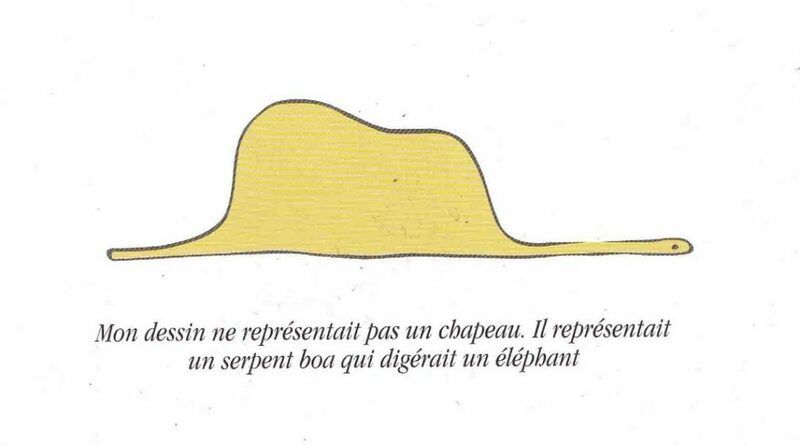 It reminds me of “The Little Prince”‘ s drawing of the boa digesting an elephant. They both have similar shape, but also you can’t understand what they are or what it’s inside them. I wanted to put a representation of veins on my sculpture but it will changed the subject of the piece. Sometimes we are drifting by capturing the image and the substance is lost. 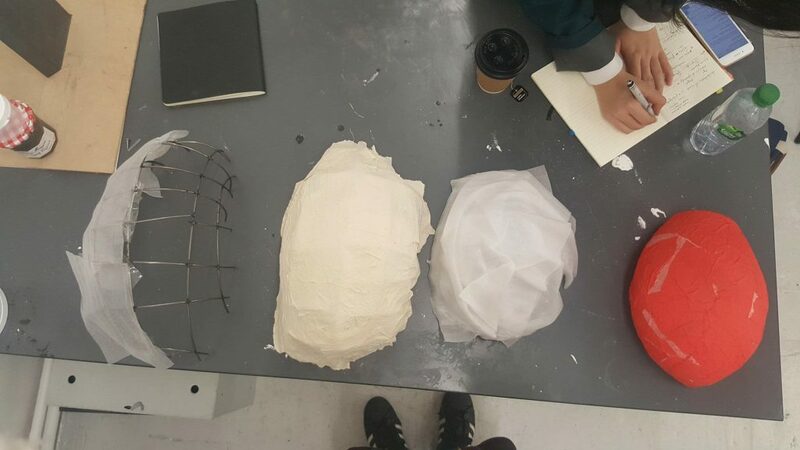 After the group crits and while I was talking about this project at my group and my tutor, I told them that I would put something like veins at my sculpture to look more realistic and fleshy and a few students asked me if I wanted my sculpture to be disgusting or creepy. I didn’t really thought that it will maybe be disgusting for some if I put a fleshy element on it. I believe that it would totally changed my idea about the comfort space. I affected a lot from the documentary “In The Womb” that I saw and I stuck in this form. W H E N I A M U N D E R W A T E R I F E E L F R E E || My project is in my thoughts all the time. Trying to figure out why I chose to deal with this idea. Why I want to make a womb. What is a safe place. How is a safe place. Do I want to feel safe. What safe is. I am 22 years old, I don’t want you to see me as a number but our society does so I do it too. I am 22 years old and it’s the first time that I am away from my family. My mom, my dad, my cat, my room, my bed, my friends, my area, my food, my language. My comfort zone. I deleted the two previous sentences twice but I retyped them. It’ s because I think I am being puerile, but that is the truth and maybe I am. I think this is why I have this need of making a womb, a place that I will feel safe. explanation of the title: Sea is a very big part of my life. I am from Greece and every summer I go to an island or seaside to swim. I had the chance to do scuba diving several times. When I overtook my fear of drowning I felt calm. Floating in the middle of the ocean, seeing only deep blue, without knowing its ending. Hearing only my breathe and my heartbeat. Almost black under my feet and the curious fear of the unknown overwhelming me. I feel free and weird, but calm. Is this has to do with our memory from when we were in the womb? Does our body has memory? Is this why we feel calm in the water? I also do it in my bathtub. I fill my bathtub with water, I lie down and I sink. I calm my heartbeat and I concentrate in the stillness. This soundproof sound inside the water that deforms all of the outer sounds. Like it is more important and bigger that the outer world and doesn’t want this world to infect its world. And I agree. You have done a really good job water, keeping your space uninfected. I feel safe in you. “Breathing Space” by Aliki Palaska. This is an artwork that I have seen in an exhibition in Athens, Greece called “Flying over the Abyss“. I am attracted from art pieces that are dealing with the body and I am also really curious to explore a variety of different materials. An unconscious procedure of our life, something so simple but so important. Our breathing. 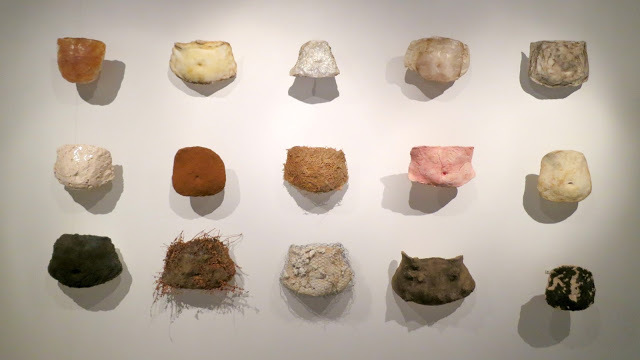 Convert all of our breathing stages into various sculptures with a different material and shape. 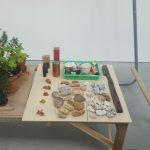 The tests of materials that I am doing in the moment reminded me of Aliki Palaska’ s piece. This is my breathing space. 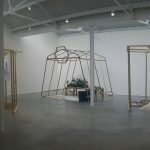 “RUN church, RUN Restaurant, Run Store” by Susan Cianciolo at Modern Art. 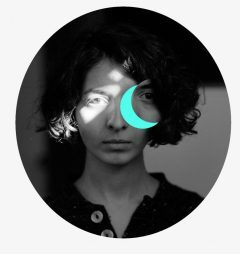 I found really interested the way that this artist presented her work. There were many kinds of paper boxes and inside of them were many different little things, from glitter to sketches. Most of them were handmade and some of them were made from the artist’ s daughter. 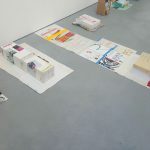 The people that were working at the gallery could only take these thinks out of the box and present them to us. I found this really fascinated because when you enter the gallery you see closed paper boxes and then a whole world appears. 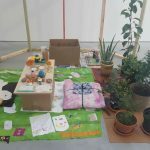 She has also made some wooden structures like rooms in another room at the gallery. I am also attracted of this idea of a space inside another space. 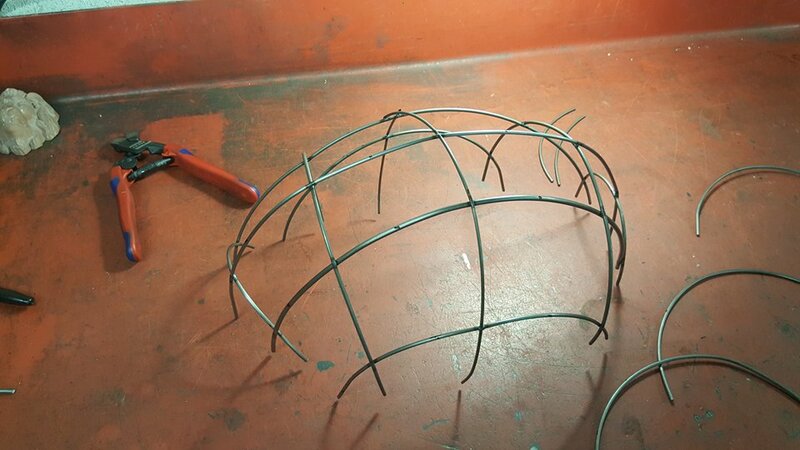 This structure will help me form my material at the shape I want. Packing foam? 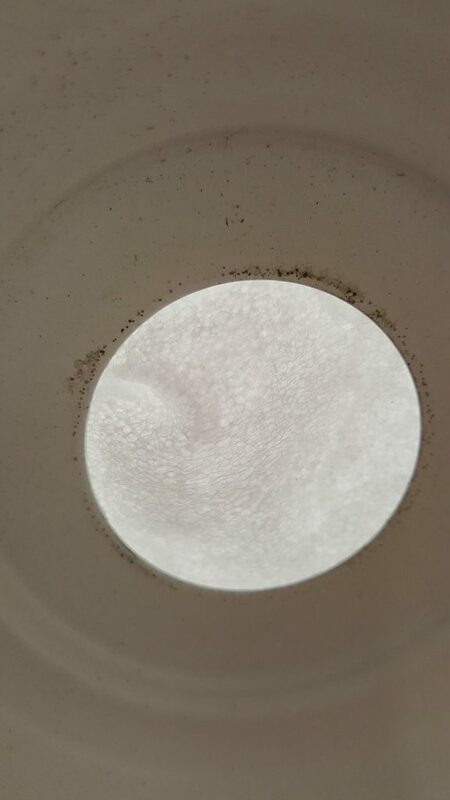 The texture of this material is similar to the skin. I put pva glue to stiffen it but it didn’t work because it couldn’t absorb it. I will also paint it with acrylics to see the result. I am not sure yet, I have to do more tests. 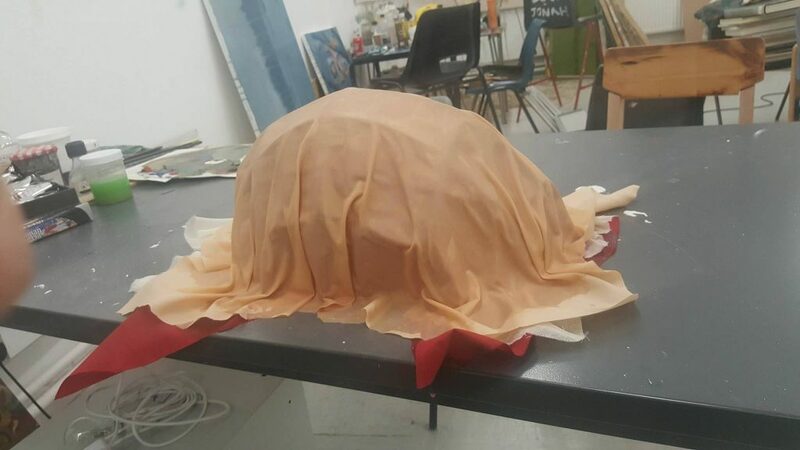 I don’t think that is the right material for my installation because is made from plastic and I want the material that I will use to be more natural because my artwork is a representation of a womb that is a body part. Something alive with flesh and blood and movement. Not plastic. 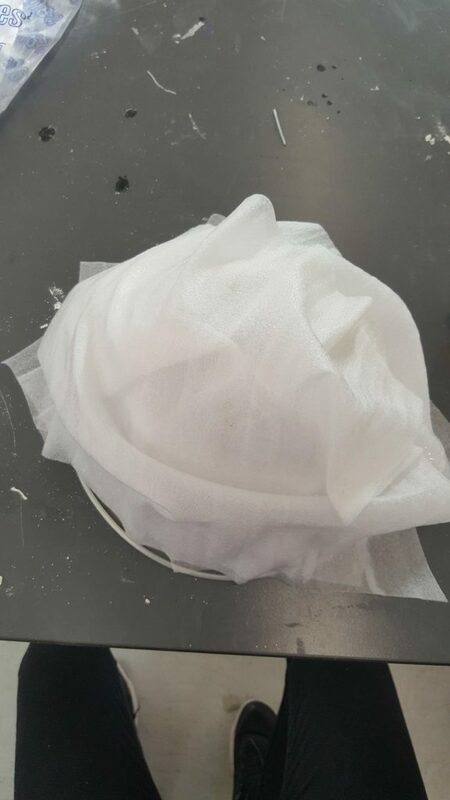 These are my first tests of materials. 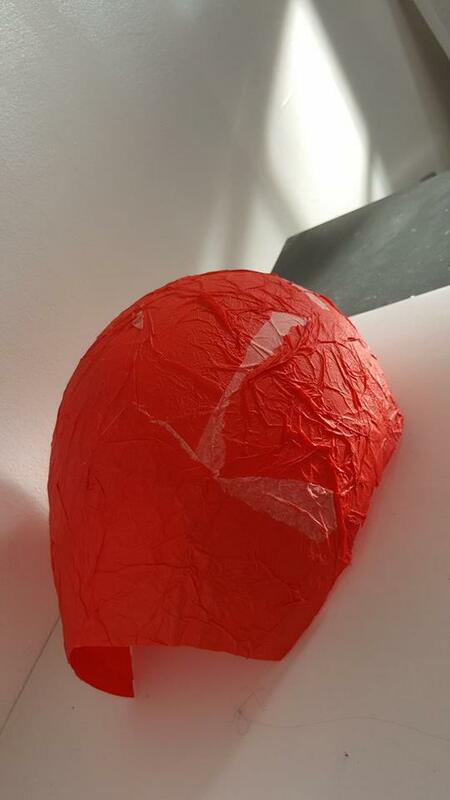 Paper mache? I want a material that the light can get through it and also natural if possible. 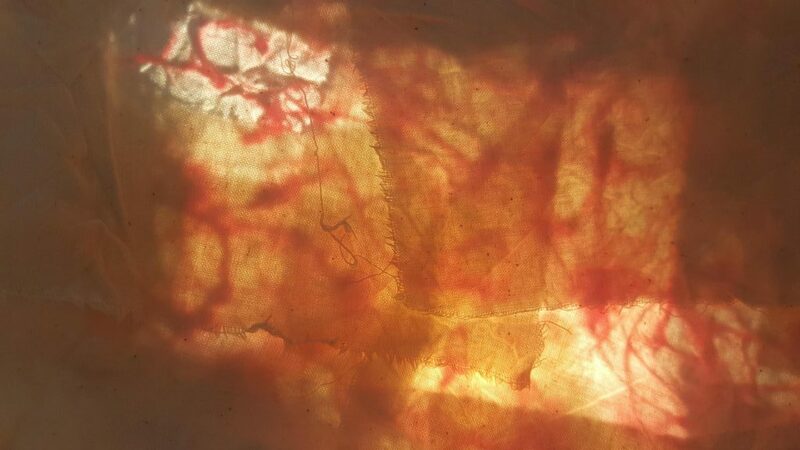 I like the lines that created from the red crumpled napkins, they are look like veins. But is it the right material? Will it be stable? Is it going to have the sensation that I want? I have to do more tests.